Conflict and instability in the Middle East, Africa, Asia, and Central America are generating record numbers of refugees. While migration pressures continue to mount in Europe and the Middle East, it remains the case that the United States operates the world’s largest formal refugee resettlement program. In response to the growing humanitarian crisis, the Obama administration in 2015 offered to accept more refugees for the first time in more than a decade, including most controversially some from Syria. Despite the recent controversy, research indicates that the long-term outcomes for refugees resettled in the country are mostly positive, but any comprehensive understanding of such outcomes requires information about how the children in refugee families—not just the adults—are faring. There are reasons to believe that refugees’ children may be particularly vulnerable to poor developmental and academic outcomes, given that their parents—and possibly the children themselves—fled violence and persecution, often arriving in the United States with little to no economic resources, social networks, or understanding of the country’s language and culture. For these reasons, one might expect children of refugees to face greater risks than children with immigrant parents who are not refugees. At the same time, the United States formally admits refugees and provides them with substantial initial resettlement assistance; these factors may protect refugees’ children—especially when compared with children of other immigrants who may be unauthorized. 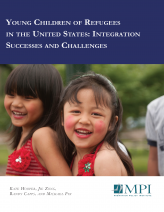 In an attempt to fill the knowledge gap on integration outcomes for children of refugees, this report presents a demographic and socioeconomic data profile of the 941,000 children ages 10 and younger with refugee parents living in the United States in 2009-2013. The report finds that compared to children in other immigrant groups, children of refugees benefit from several protective factors, including strong family structures, high parental employment, and high parental education, all of which facilitate their successful integration.